i can’t remember who shared this graphic with me first, but once i saw it, i couldn’t unsee it. caption: pink post-it note with three circles connected with a horizontal line. 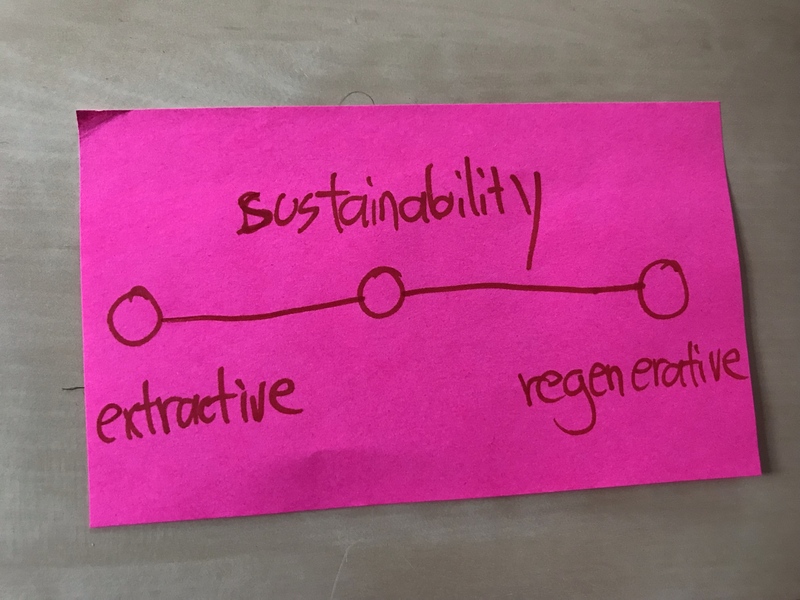 the left circle is labeled extractive, the middle circle is labeled sustainability, and right circle is labeled regenerative. the image speaks for itself, but it’s worth writing out just to have the words down: sustainability is the midpoint between extraction and regeneration. and the world we have inherited from our ancestors, the world we are living, sustainability isn’t actual enough. it has never been enough. the status quo is killing us and, if maintained, it will destroy the planet’s capacity to hold our species. keeping things as they are means supporting the dominant extractive cultures many of us live in and encouraging many cultures that are not yet extractive to become extractive. thankfully, we are learning. at the level of dominant culture, sustainability is on its way out and regeneration is on its way in. smaller cultures have known this truth for forever (probably). the rest of us are catching up (remembering?) and i’m excited for it. the shift from sustainability to regeneration makes a ton of old questions obsolete and a series of new questions much more interesting. the biggest of realm of this for me is the evolution from competition to collaboration and cooperation as primary determinants of survival capacity. in a world of extraction and sustainability, almost everything can be meaningfully framed in “us vs. them”: if we lose something, they win something and vice versa. in that context, it’s easy to get caught up in winners and losers and strategy that prioritizes your own winning at the expense of (or just not caring about) the losers. regeneration makes that obsolete. now the task becomes: how can i improve things for myself in ways that also make it possible for others to benefit? how can i engage in my community in ways that give back to the community and improve it, too? the shift in this direction won’t happen without hard work, but if we can make that leap, we just might make it.